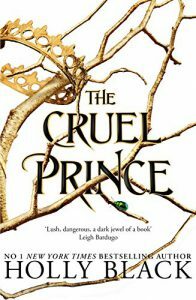 The Cruel Prince by Holly Black is a young adult, fantasy novel dealing with the political machinations of the fae. Jude’s mother used to be married to a faerie lord but she ran away with their half-faerie daughter, married a human, and had two purely human daughters: Jude and her twin. Then the faerie lord came looking for her. He murdered Jude’s mother and took the children back with him to his lands. Years later, Jude is being raised alongside the children of the lords and ladies of faerie, who resent having humans among them. Bullied and belittled by the faeries, Jude hates feeling powerful. She wants to do something to get real power so that she won’t be hurt again, but her path to power involves making a deal that may put her in even more danger when she agrees to work as a spy for a prince of Faerie. This is an interesting story that deals with politics and factions all vying for power. As Jude learns more about the different players, we get a feeling for how the different groups interact, but it also feels sometimes that this is barely scratching the surface. There’s an interaction quite late in the book when she turns to another character for advice and I think this is a key moment, because it shows how complicated the situation really is and how much Jude is struggling with it. Jude is a great character. She’s clever but young enough that she makes mistakes that are believable. She gets into difficult situations through her own actions, but the reasoning that got her there makes sense. She’s not exactly nice, but it’s understandable why she acts the way she does. We see enough of the bullying and pain she suffers through that her choices make sense. The same is true of some of the other characters. There are characters who are horrible people, but you get enough of a glimpse of their lives to understand how they became that way. There are a lot of horrible people in this book, but there are some who are friendly and fun. I really enjoyed the scenes between Jude and the other spies. The other relationships I really liked were those between Jude and her sisters. I got a feeling of a real family relationship between them. There are arguments (even a duel at one point) but also love. They fight with each other, but also fight for each other. They don’t always agree, but they always care. The dynamic between the sisters is there throughout the book and plays out in interesting ways, sometimes adding to the conflict and sometimes helping Jude. That complex dynamic helps even a story about magic and faeries feel grounded in something real. This book isn’t going to make my favourites pile, but it’s definitely an enjoyable book of its type. I have no particular criticisms of it. The story is interesting enough to keep me reading and the characters are nicely rounded. A solid four stars. I enjoy celebrating Christmas even though I’m not religious. I enjoy spending time with my family, exchanging gifts, eating good food, seeing all the lights everywhere, decorating the Christmas tree, and all the different traditions that go around it. But you also find that different family groups have their own traditions and practices. For some families, religion is the central piece of the celebration and so there are carol services and nativity events, mangers and midnight mass. For others, religion doesn’t play a part in it and the traditions are centred around family and friends. We have a few traditions in my family. Like meeting up to go and look at the wildlife photography exhibit in the Natural History Museum. Various aunts, uncles, cousins, partners of cousins, and so on all meet up to have a look at the photos and then go out for a nice meal. This isn’t something you would find in any summary of the Christmas traditions, but it’s something we’ve done for a few years now and so it’s become part of our tradition. We have other things, like a trip to the cinema on Christmas Eve with my parents, and a hamper that we all contribute too. This isn’t a fancy hamper packaged up by a shop, but a box that we all fill with special treat foods, things that we don’t get very often, or things that just seemed different and fun. Sometimes things in the hamper are specifically intended for one person (like the crystallised ginger my mum loves) but other things are intended for all of us (like a shared chocolate orange). So why am I talking about this on a writing blog? I think when world-building, it’s tempting to make everything too homogenised. All the people in this area follow the same religion and practice the same traditions in the same way. In the real world, it doesn’t work that way. Everyone has their own subtle takes on the standard. Even in the same region, culture, and religion, you will find variations. It’s worth including that in your stories, and especially tying it into other factors. The differences around a shared experience can be a great way of highlighting other differences between characters or showcasing their backgrounds or even bringing in moments of conflict and character development. Perhaps one character makes a big deal about the shared meal because they used to go hungry a lot when they were younger, and having lots of good food is a reminder to themselves that those days are over. Perhaps one character follows an older set of traditions because of a religious upbringing. Perhaps one character feels that they have to shower everyone with gifts while another feels uncomfortable receiving so much and ashamed because their own gifts are small. Perhaps that could be a cause for resentment between those characters. I enjoy creating traditions, rituals, and celebrations in my world building, but it can be fun to think about all the different takes people might have on these same traditions, and the ways that they might add to them based on their situation or character. Next time you’re inventing some big holiday in your world, consider each of your characters and imagine how each of them might treat this holiday a little differently.